1. 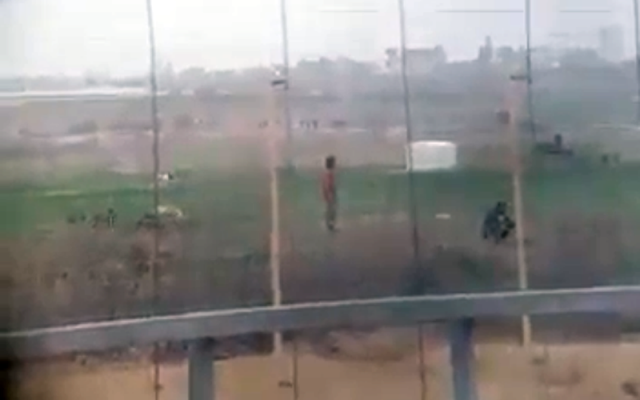 The IDF is investigating a video that surfaced on social media Monday that appears to show Israeli soldiers cheering as one of them shoots and fells a Palestinian who approached the Gaza security fence. 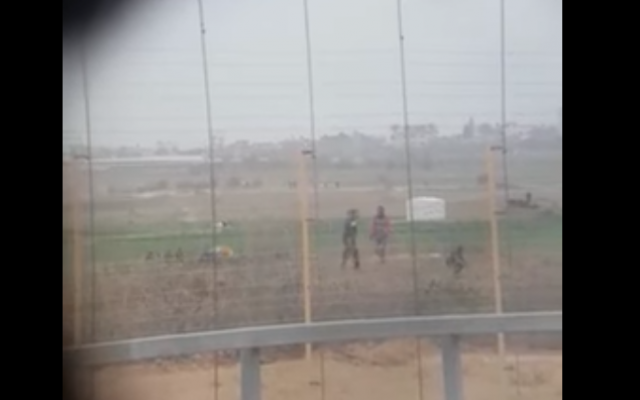 In the video filmed through a rifle scope, the Palestinian man does not appear to be armed and was not throwing rocks or firebombs at either the security fence or the Israeli troops on the other side. The army said the incident took place several months ago, and swiftly vowed a “thorough” probe. The Yedioth Ahronoth daily on Tuesday identified the video as being from December 2017. Unsurprisingly, the Hebrew press has plenty to say about the incident. “It’s not clear what exactly happened,” Yedioth columnist Ben Dror Yemini writes. “But if a picture is worth a thousand words, a video must be worth ten thousand. In any case we must investigate this.” While Yemini says that on the battlefield soldiers sometimes release an outburst following a highly tense situation, he called their cheers heard in the video “unnecessary. 2. On Monday Yad Vashem said the Syrian regime’s latest suspected chemical weapons attack on a rebel-held town shows that international organizations set up after the Holocaust have failed in their job. The chairman of Israel’s official Holocaust memorial said the images of citizens, including children, being massacred just beyond Israel’s border reveal crimes against humanity that the world must step in to stop. Avner Shalev said they were allowed to take place because of the “world’s indifference,” and called on international bodies to act decisively to end the suffering. The Foreign Ministry said the attack “joins a long series of similar attacks using chemical weapons” by the Assad regime after it undertook to disarm from such weapons. 3. 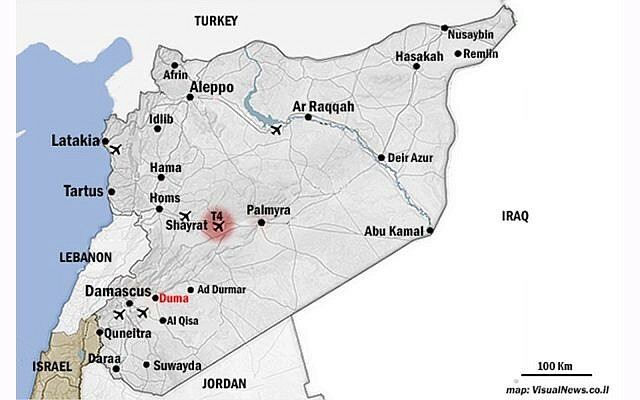 Both Russia and Syria are blaming Israel for Monday airstrike on a military air base in central Syria that reportedly killed at least 14 people, including Iranians active in Syria. 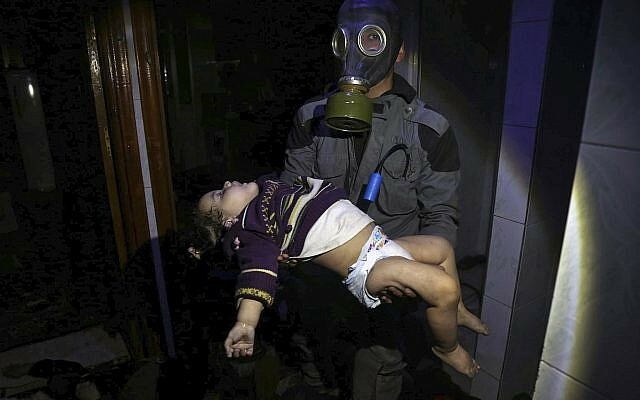 The Israeli army has refused to comment. According to a media outlet affiliated with the Iran’s Islamic Revolutionary Guard Corps, seven Iranian soldiers were killed in the strike. Tehran accused Israel of “flagrant” aggression in Syria and condemned “strongly the aggression and the airstrike by the Zionist regime” against the T-4 airbase in Homs. Meanwhile, the Kremlin protested that it had not been informed of the strike in advance, saying it was a “cause of concern for us.” Hours later, Israel’s envoy to Moscow was summoned by the Russian foreign ministry to discuss the strike. On Monday afternoon, Prime Minister Benjamin Netanyahu warned that Israel would strike anyone who intends to harm the country, appearing to indirectly refer to the predawn missile strike. 4. Hamas leader Ismail Haniyeh called Monday on Gazans to keep up their protests on the Israeli border that have resulted in deadly clashes.”Gaza enters a new stage of peaceful and popular resistance,” Haniya said during a visit to a tent camp for protesters. Since March 30, the Gaza-Israel border has been the scene of major protests, with tens of thousands of Palestinians demonstrating against the Jewish state. Some 31 Palestinians have been killed in clashes with Israeli troops since then. 5. The family of prominent Palestinian protester Ahed Tamimi on Monday released excerpts from a video in which an a Shin Bet interrogator threatens the then-16-year-old with the arrest of her relatives if she refuses to cooperate. The interrogator also comments on her body, fair skin and “eyes of an angel” and at times moves within centimeters of the teenager, who doesn’t respond and repeatedly asserts her right to remain silent. 6. Hapoel Holon has cut its star player Glen Rice Jr. after he punched a teammate in the face. The top Israeli team says it released Rice after the team’s Monday night loss because of a “severe disciplinary infraction.” It says Rice punched teammate Guy Pnini in the face in the locker room. Pnini was hospitalized with a suspected facial fracture. The 27-year-old Rice is the Israeli basketball league’s top scorer, averaging more than 24 points a game, and has led Holon to the top of the standings. 7. The left-wing daily Haaretz runs a op-ed by Amira Hass claiming the BBC is biased in Israel’s favor. She says the broadcaster, which has been repeatedly slammed by Israel for what it says is biased coverage of the conflict, has been intimidated into toning down its criticism of the Jewish state. 8. 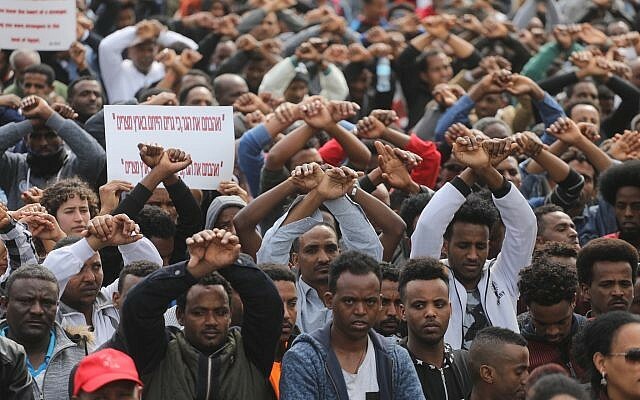 And finally, Israel’s saga of trying to forcibly deport African asylum seekers en masse without violating its own constitution, continues. The state tells the High Court of Justice in a hearing on Tuesday that there is a “high probability” the 40,000 or so asylum seekers from Sudan and Eritrea will be safely be deported to a third, unnamed country. Though the state refuses to say which country has agreed to accept the migrants, it is widely reported to be Uganda. State officials tell the court the unnamed country has already been approved by Israel’s attorney general as a destination for asylum seekers who agree to leave Israel in exchange for $3,500 and a plane ticket.